You can't always have the best seat in the stadium, but that shouldn't stop you from catching dazzling close-ups of the action. With COOLPIX L330's powerful 26x optical zoom lens, you can easily capture beautiful 20.2-megapixel photos and HD videos from great distances. The camera's ergonomic grip and lens-shift Vibration Reduction technology combat the effects of camera shake—big advantages when shooting at super-telephoto distances. Its 3.0-inch high-resolution LCD display with anti-reflection coating makes framing and reviewing shots a breeze, even in sunlight, and though it looks sophisticated, COOLPIX L330 is super easy to use. If you're serious about taking photos and HD videos, you need a camera with serious power. COOLPIX L330 delivers. Every COOLPIX is designed around a genuine NIKKOR glass lens, the legendary optics that have made Nikon famous. 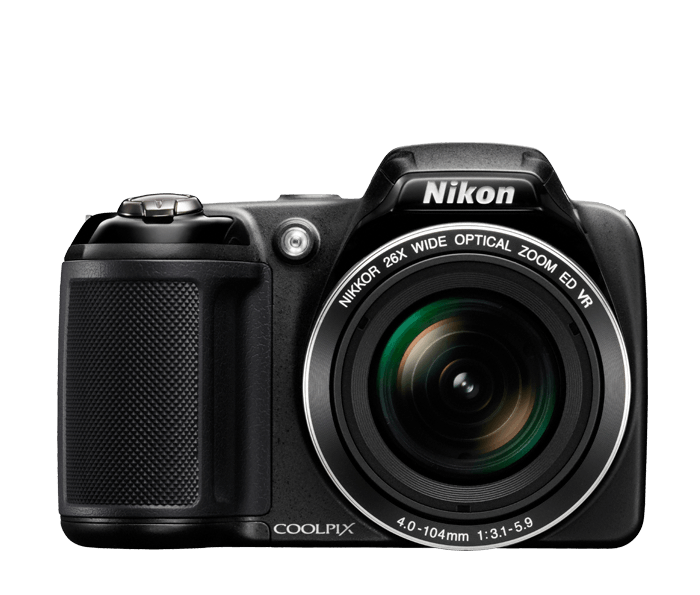 The COOLPIX L330 features a 26x Zoom NIKKOR lens that takes you from wide-angle group shots to telephoto close-ups in an instant. And don't worry about a little camera shake—Lens-shift Vibration Reduction keeps the shot steadier even when your hands are not. Create beautiful high-resolution photos and videos with ease. The COOLPIX L330's high-performance NIKKOR glass lens is paired with a 20.2-megapixel CCD image sensor that captures bright, vibrant images you'll love sharing. You will feel a difference when handling the COOLPIX L330 for the first time. Its ergonomic design fits comfortably in your hands and puts key controls like zoom and video record right where you want them. This makes for more stable zooming, framing, shooting and video recording, and it means you won't have to take your eyes off the large, bright 3.0" display while you're capturing memories. The COOLPIX L330 is so easy to use, anyone can take great photos and videos with it. Select Easy Auto Mode, and the camera will automatically adjust the settings to get the best shot possible. One of the most important parts of a camera is its lens, and COOLPIX cameras have some of the best—legendary NIKKOR glass lenses. These renowned optics have helped make Nikon the choice of so many photographers. Zoom farther, take crystal clear closeups and enjoy sharper, more vibrant photos and HD videos.